Kurt Jastrow has the best day job a science fiction writer could ask for. In the 1950s, at the peak of live television, he’s the lead writer for Brock Barton and his Rocket Rangers. A show every nine year old loves, Jastrow writes three shows a week (with Monday and Wednesday’s shows ending in cliffhangers, of course), and squeezes in a few minutes of actual science at the end of every episode. It’s not a glamorous life to be sure, but Kurt has plenty of time to polish his science fiction stories, harass his shellshocked editor, and try to convince fellow writer Connie Osborne to go out on a date with him. Everything was going swimmingly (if rather ho hum) for Kurt, until he gets a visit from extra terrestrial ultra-rationalists, who want to thank him for doing such an amazing job promoting scientific enlightenment via Brock Barton and the real science demonstrations at the end of the show. The aliens want to give Kurt his award on live TV! And oh, they want to punish anyone who isn’t rational like they are, namely the few million people who tune into the network’s religious programming every Sunday morning. Almost sounds like the alien invasion script someone like Kurt would write for a much better TV show than Brock Barton . . . The Madonna and the Starship is Kurt Vonnegut meets Galaxy Quest, where everything, and I do mean everything is poked fun at, satirized, and made to look completely silly. Like the best South Park episodes, there are no sacred cows. I highly doubt that anyone reading this would actually be offended by anything in it, we’re all intelligent balanced individuals, right? When the book isn’t making you laugh, it’ll be making you think about your philosophical assumptions about both religion and rationality. Kurt only has a days to convince the aliens not to zap a bunch of humans, and it turns out the best way to do this is have Connie completely rewrite her next tv show (which happens to be one of those Sunday morning religious shows) into a satirical episode. The second half of The Madonna and the Starship is one madcap scene after another, and not to spoil it, but it involves Jesus being visited by space explorers from the future, aliens who don’t understand sarcasm but do understand Poker, the funniest shellshocked editor ever, and more cue cards and quick camera changes than you can shake a stick at. But The Madonna and the Starship isn’t just about aliens crashing a TV show and causing a live show to be filmed with no script. Kurt is a science fiction writer, and Morrow takes ample opportunity to touch on people’s preconceived notions of what science fiction writing is. Is it straight up pulpy kids stuff, like Connie thinks, or is it respectable literature that teaches as it entertains? While you’re thinking about that every few pages, Kurt’s internal monologue is reminding us that he would never, ever put the cheesy lines people say into any of his stories. and it’s funny! At novella length, The Madonna and the Starship is an entertaining and highly satisfying quick jolt of fun, fast readers will be able to zip through it in an afternoon. Morrow’s characters start plenty of conversations that due to a deadline they are unable to finish, and I wouldn’t have minded if Morrow had skipped right through novella word count and made it a full length novel. Now that I think about it, I’ll bet the point of those unfinished conversations was because Morrow wanted his readers to finish them themselves. Want to learn more about James Morrow? Check out my interview with him over at SFSignal. 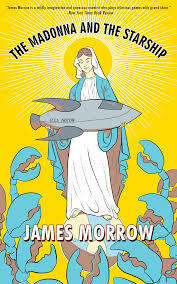 10 Responses to "The Madonna and the Starship, by James Morrow"
I’m a big fan of James Morrow, so news of this, his latest book, is music to my ears. Can’t wait to read it! James Morrow is one of the authors whose books I will buy as soon as they are available. He never lets me down. He’s got another one coming out next spring, it’ called Galápagos Regained, looks like a lot of fun! You know, that’s exactly why I picked this up. Wanted something guaranteed entertaining, but needed a break from the doorstoppers. the further you get in the book, the less silly everything is. or well, depending on how you think about it, maybe the more silly/absurd it all gets. Maybe they turn into turnips. This book looks and sounds great. I am happy that you reviewed it. I want to thank you for adding more books to my TBR pile..lol. Ok meets Galaxy Quest is something I need to freaking read. I had put this somewhere out of reach when it arrived but now knowing its so fun and that it really is short I’ll pull it off the shelf. Oo look i turned my head now and the yellow cover shot out at me!